This New York Times article here could have been a perfectly reasonable thought piece on the (perhaps unintended) effects of several provisions in the tax code. But in an institutional desire to land a few more blows on Trump, they tried to morph it into a hit piece on Jared Kushner --"Jared Kushner Paid No Federal Income Tax for Years" screams the headline. Look NYT: I find Trump distasteful as well. But you only embarrass yourself presenting as some kind of investigative bombshell that Jared Kushner used perfectly legal deductions to minimize his tax bill. Kushner Companies buys a property. The majority of the money for the purchase comes in the form of mortgages and personal loans from banks. Under the federal tax code, real estate investors can write off the purchase price of the building — excluding the cost of the land — over a period of decades. Although Kushner Companies has spent little or no cash of its own, the firm takes large annual deductions based on the theoretical depreciation of the building. The property generates cash for the Kushners. But any earnings, which would be subject to the federal income tax, are swamped by the amount that the company is taking in write-offs for depreciation. The result is that Kushner Companies records a net loss for tax purposes. The company passes on that loss to its owners, including Mr. Kushner and his father, Charles. The loss can be used to offset the Kushners’ income in the year it is recorded, and it can be carried forward to cancel out future income or to get refunds for taxes they paid in previous years. When Kushner Companies sells a property, it can use the proceeds to finance a new acquisition. If done within the right time frame, the company can indefinitely defer any capital-gains taxes it might owe on the sale of the original property. So here is my confession. I did the exact same thing just last year on my taxes. Take one example: One of my businesses bought and installed $350,000 of equipment. I financed 100% of this purchase. The article says that Kushner depreciated his real estate purchases over decades but the tax code's accelerated depreciation provisions allowed me to depreciate this purchase 100% in the first year. So I had an immediately $350,000 loss that I netted against other income, grealy reducing my taxes on that income. In fact, I don't think I was able to use it all due to various tax rules and I carried over a part of it to cover 2018 taxes or beyond. One could argue about whether the accelerated depreciation provision I took advantage of is too generous, but the tax code is always going to allow depreciation against some formula (or else every business would be substituting crazy rental schemes for capital investment). The depreciation provisions are pretty standards as described across all businesses, except to say that they are less generous than the ones I get buying equipment. Again they seem to think that somehow the fact that he borrowed most of the money is relevant to this -"Mr. Kushner is getting tax-reducing losses for spending someone else’s money" -- but his financing strategy is not the least relevant. He took on a costly and risky long-term obligation when he borrowed the money. Is the NYT arguing for requiring cash accounting for taxes?? This is just embarrassingly ignorant. This is entirely normal for s-corporations and LLC's. These were promoted for small business, and they are fabulous tools for entrepreneurs, but you have to provide these legal tools to all people, even to rich people in families you don't like. This is entirely normal. Any other rule would be grossly unfair and a kick in the nuts for entrepreneurs. I often spend money this year that generates revenues next year. The tax code recognizes this and agrees that the losses I took this year can be netted against the revenues next year that they helped to facilitate. This is the only thing that is mildly unique to real estate and his business. I don't really get the same rights with any of my assets, though my assets mostly depreciate rather than increase in value. I won't pass judgement on this one, but I suspect that it has a lot of support (homeowners get it, for example, as do owners of second homes). Nowhere is there even a suggestion of how the tax code might be altered to fix those things the NYT does not like about it. I would suggest that any step that would alter any of the 6 steps above would be opposed even in a Democratic Congress. This all reminds me of a piece a few years ago arguing that oil companies got a lot more subsidies than renewables like wind and solar. Checking it out, the vast, vast majority of the subsidies were ... LIFO inventory accounting and depreciation, both tax rules that are 1) merely about timing of taxes and not total paid and 2) apply to all manufacturing businesses in all industries. "F.D.A. Cracks Down on Juul and E-Cigarette Retailers" today, via the NYT. As of this moment, cigarette-maker Phillip Morris stock is up nearly 4.5% on the news. This happens so many times in sloppy policy making that I can't even count them. Do-gooders assume that when they ban things, like e-cigarettes, that individuals will turn to the regulators' preferred alternative, in this case abstinence from any type of vaping or smoking. But in fact, many are much more likely to switch to tobacco smoking, which is orders of magnitude more dangerous than vaping. Adults who think these things through, like investors on Wall Street, understand this so that is why Phillip Morris has gained over $5 billion in value today. The FDA is working to create a whole new generation of tobacco smokers. When I hear that "that teenage use of electronic cigarettes has reached 'an epidemic proportion,'" unlike the regulators I do not immediately assume this is unalloyed bad news. Another way of putting this is an "epidemic of teenagers who are turning to safer alternatives to really damaging tobacco products." And if you want to be really, really cynical about this, you might remember that with the huge government tobacco settlement, the government essentially made itself business partners with the large tobacco companies. Any competitors threatening the top companies in the settlement seriously threaten tax income to many state governments. Life in the Trump Era: Conservatives Now Define Raising Taxes as "Progress"
I am not sure how narrowing the scope of products subject to lower taxes is a "boon" to this country, though I suppose labor unions might be happy and one is suspicious that this is sufficient reason for the NYT to support it. My suspicion is that these numbers are incredibly carefully tailored by Ford and GM lobbyists to hit a couple of their competitors while missing themselves -- this has all the fingerprints of a classic crony deal that benefits very few powerful groups to the detriment of most consumers. So, from 62.5% to 75% to qualify for zero tariffs. Not exactly radical, but positive. So broadening a US government tax on US consumers is "positive." Powerline in the past has rightfully chided Paul Krugman for abandoning his understanding of economics in favor of cheerleading the Democratic team. Now Powerline is doing the same for Trump. Category: Economics, Trade Policy | Comments Off on Life in the Trump Era: Conservatives Now Define Raising Taxes as "Progress"
Just one day after their coordinated virtue signaling about their important role in maintaining a civil society**, a coalition of media companies have filed a motion (pdf) seeking the names and addresses of the jurors in the Manafort trial. I am a huge supporter of sunlight and disclosure in government, and perhaps there is a precedent for this, but it seems like a terrible idea. I have served on two criminal juries in my lifetime and I can guarantee you I would have resisted participation had I known that my name and home address would be released to the public in association with the trial verdict. CNN in particular has some history in misusing doxxing. A year or so ago they threatened a Reddit user with doxxing if he didn't stop posting a meme critical of CNN. Given that probably 95% of the employees of this media coalition probably want to see Manafort convicted, there is real reason for concern how this information might be used. In FOIA rules, the decisions to release a particular piece of information to one petitioner is a decision to release it to everyone, I am not sure if similar rules would apply here. Kind of hoping that Ken White at Popehat chimes in on this. ** A conclusion I am sympathetic to, though I think the media undercuts their argument a bit by acting as thin-skinned and as childish at times as President Trump does. Update: Judge denies motion. Good. What is ironic is that the majority (probably all) of the people involved and interviewed probably support the deinstitutionalization craze that has gripped America since the 1970s. I wonder whether a firm public policy of forced commitment would have helped this woman. My suspicion is that it would have. That is not to say that our institutions were wonderful, but an all-or-nothing approach makes no sense. We have moved the mentally ill out of sometimes awful psychiatric facilities into the revolving door of the street, prison and an early death. I was among those who has opposed forced institutionalization. The practice used to be rife with abuse, and when it was really being challenged in the 1970's it was with recent knowledge of how institutionalization for supposed mental health issues had been used in the Soviet Union as a tool against dissent. And in a world where political partisans still routinely assign negative mental health diagnoses to their political enemies and have even suggested using mental health diagnosis-from-a-distance to unseat the current President, there is still a lot of possibility for abuse. But seeing that most of those who would have been in state mental hospitals are now in prison or living (and dying) on the streets, I am open to having made a mistake. I am still not sure, though, who advocates for such people who are without friends and family and would help guard against their abuse. It is hard to look at this data and see anything but a positive story, but apparently the New York Times and the rest of the media only see tragedy. If there is no problem, there is no justification for increased government power, therefore there must be a problem. (I am presuming this is in real dollars rather than nominal, but God forbid that the NYT ever makes such things clear). They do manage to show a slight negative recent trend in the growth of the percentage of low income Americans, but only by cherry-picking the dates of comparison to the peaks and troughs of the last two business cycles. 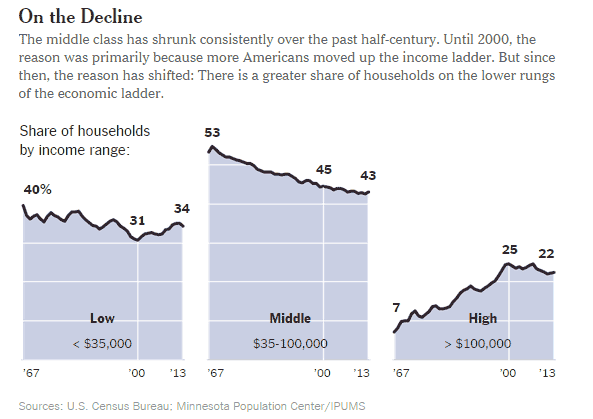 Overall I would read the story as middle and lower class are moving into upper income brackets, but the Times headlines it as "Middle Class Shrinks Further as More Fall Out Instead of Climbing Up," illustrated with a classic empathy-inducing sad-mom photo. By the way, since more rich people fall than middle class, it would seem to make sense to discuss instead the falling fortunes of rich people, but of course the NYT has no desire to write that article. How Did Obamacare Authors Ever Fool Themselves Into Believing They Were "Bending the Cost Curve" With These Kind of Incentives? 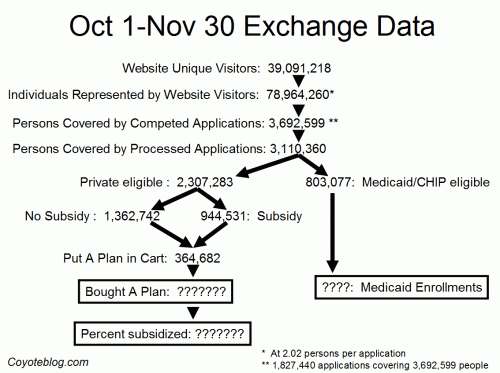 I guess I never really paid much attention to how the Obamacare "risk corridors" work. These are the reinsurance program that were meant to equalize the risks of various insurers in the exchanges -- but as exchange customers prove to be less healthy than predicted, they are more likely to become a government subsidy program for insurers. So what, exactly, are the incentives for cost control? If you lose control of your costs, the government simply pays for the amount you overspent. Combine this with the fact that Obamacare puts caps on insurer non-patient-cost overhead spending, and I don't think you are going to see a lot of passion for claims management and reduction. 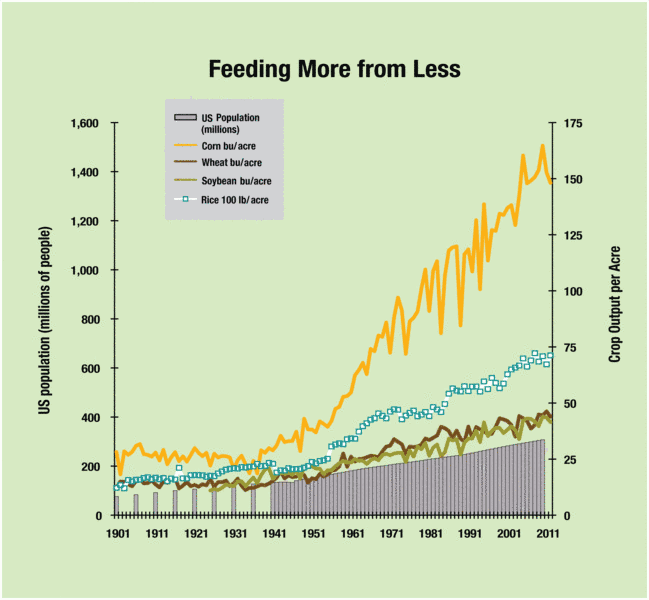 Note after a point, excess claims do not hurt profits (via the risk corridor) but more money spent on claims reduction and management does reduce profits (due to the overhead caps). Postscript: There is one flaw with my analysis -- 3% is a LOT of money, at least historically, for health insurers. Why? Because their margins are so thin. I know this will come as a surprise with all the Obama demonization of insurance profits, but health insurers make something like 3-5% of revenues as net income. My Boston mother-in-law, who is a very reliable gauge of opinion on the Left, thinks I am lying to her when I say this, even when I show her the Google finance pages for insurers, so convinced is she by the NYT and PBS that health insurer profits consume a huge portion of health care spending. All that being said, I am pretty sure if I were an insurer, I could raise prices slightly, cut back on claims overhead, and make a guaranteed profit all while the government absorbs larger and larger losses. Apparently when prices for things are arbitrarily doubled, the demand for them goes down. On Monday, about 175 employees of the buffet restaurant in the slot-machine and electronic gambling casino in Ozone Park learned that the restaurant had been closed and that their jobs no longer existed. The casino had received plaudits when, in late October, a labor arbitrator issued a ruling that doubled the average pay of workers. In October, Mr. Canoâs pay went from just over $5 an hour, plus tips for the drinks he delivered to the tables and dishes he cleared, to around $12, because of the living wage agreement. This is one of those regulatory overreach paired with corporate cronyism stories, so I won't express any sympathy for the business involved -- it is earning huge rents from insider political deals it cut, and though the NYT does not explain it very well, my sense is that the arbitration requirement on wages was part of that political deal. But it is amazing to me how much the Left has simply hypnotized itself into believing that minimum wage increases don't affect employment. If we go back a number of months and look at the article where the NYT announced the arbitration decision, there is not one single mention that there might be some job security issues with forcing a doubling of wages. Jeannine Nixon looked as if she had hit the jackpot. Ms. Nixon, a customer relations representative at in Queens, had just learned that she would be making $40,000 a year, up from $22,300. It is amazing to me that it did not even occur to any at the NYT to think that a doubling of worker pay might be anything but a pure bonanza. I suppose they were blinded by a sense that casino margins were so high (though I find that the public consistently overestimates margins of many businesses, confusing revenues with profits). Even if the casino is wildly profitable, one had to consider that all activities in the casino were not equally profitable. Restaurants often have thin margins and 20-30% labor costs. There is simply no room for doubling them in a business that typically has single digit margins at best (in fact, most restaurants lose money). The biggest reason is that only about 3% of American workers earn the minimum wage. So even a large drop in minimum wage job prospects, say by 10%, might only affect total US employment by a few tenths of a percent, a number that might not be seen in the general economic noise. Minimum wage increases are typically implemented in small steps and announced well in advance. Looking at employment the day after vs. the day before the actual date of change likely misses most of the effect. For example, California announced almost a year in advance that minimum wages were going up by 25% in July of 2014. Our company closed one operation and made substantial reductions in our work force in response, but we made these changes in December 2013, months before the change actually took effect. Which makes this article in the Arizona Republic by Ronald Hansen one of the worst, most facile bits of economic analysis I have ever seen. But, at the most basic level, there is good reason to think the minimum wage doesnât kill jobs. The minimum wage has gone up 22 times since it was instituted in 1938. There is complete seasonally adjusted data from the U.S. Bureau of Labor Statistics available for 21 of those hikes. In 15 of those 21 cases, the U.S. economy added jobs in the year after the minimum wage went up. On 11 occasions, it added more jobs after the hike than it did in the year before the raise went into effect. This alone suggests that raising the minimum wage isnât an automatic drag on employment growth. This is simply absurd for all the reasons I listed above. I understand how I might find this kind of "analysis" in the comments section of the Daily Kos, but how does one get this past an editor? 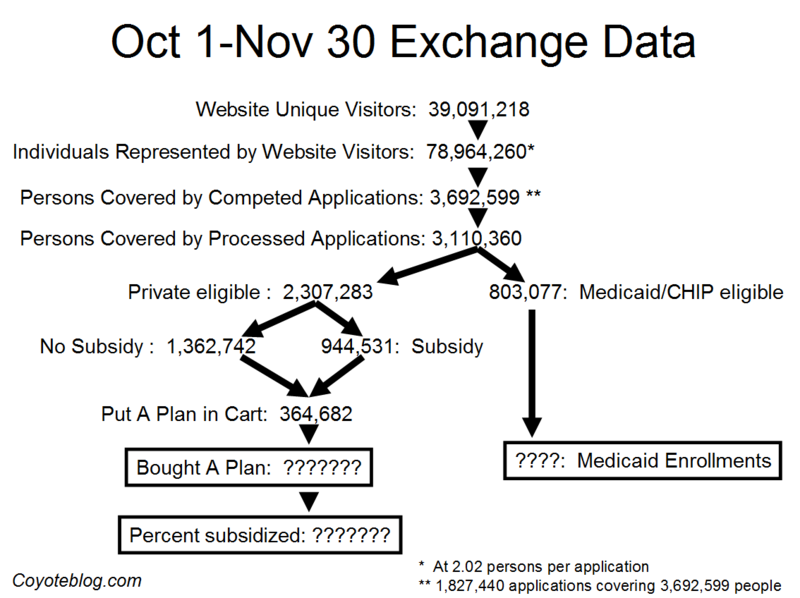 About one-fourth of the people who have entered their income information on their applications were deemed eligible for subsidies on the exchanges (about 900,000 out of about 3.6 million), which is lower than the number we saw in October alone and remains really far from what was projected. The CBO projected that just 1 million out of the 7 million people to enroll in the exchanges in the first year would be ineligible for subsidies, so the ratio is way off from what was expected (15–75 vs. 75–25). I had some thoughts on that surprising fact a month ago, and I’ll add a couple now: Unsubsidized customers (basically, those above the national median income) are generally savvier and more likely to have the resources to enroll and make their payments ahead of time, so maybe this is understandable and doesn’t say anything about who will eventually enroll. On the other hand, it may demonstrate that the people to whom insurance was supposed to be expanded — the uninsured, who tend to be low-income and not well educated — aren’t getting to the exchanges at all, and covering them will be a much longer term project. There are 3 major mistakes, each worse than the one before. MISTAKE 1: The 3.6 million total applicants number is in line 3 (3,692,599). This is the wrong number. The number he should use is line 4, the number of people who have had their eligibility processed. So the denominator should be 3.1 million, not 3.6 million. MISTAKE 2: He leaves out the Medicaid piece. Seriously, if we looking at numbers that are partially subsidized, why leave out numbers (Medicaid and CHIP) that are entirely subsidized? This means the applicants eligible for subsidy are 803,077 + 944,531 or 1,747,608 which is 56% of the processed applicant pool. The subsidy number may be lower than expected but I get the sense that the Medicaid percentage is higher than expected. MISTAKE 3: They are looking at the application pool, not the sign-up or enrollment pool. That is understandable, because the Administration refuses to give the subsidy percentage breakdown of those who have selected a plan (a number which they certainly must have). My guess is that people are putting in applications just to see if they are eligible for subsidies. If not, they quit the exchange process and go back to their broker. That is what I will probably do (out of curiosity, I would never accept taxpayer money for something I am willing to pay for myself). The people who actually sign up for coverage are almost certainly going to skew more towards subsidized than does the applicant pool. Making reasonable assumptions about the mix of subsidies in the "selected a plan" group, one actually gets numbers of 80-90% Medicare and CHIP and subsidies in the enrollment pool. I do think McArdle is correct in saying that the uninsured numbers were both exaggerated and mis-characterized. I have been saying that for years. I asked Louise Melling, a lawyer at the American Civil Liberties Union, which has a distinguished history of championing free speech, how the group had evaluated the case. But the equal treatment of gay couples is more important than the free speech rights of commercial photographers, she said, explaining why the A.C.L.U. filed a brief in the New Mexico Supreme Court supporting the couple. Earlier, Olson made the useful point that large organizations like the ACLU are not monolithic -- they have internal conflicts on issues like this. But based on my interactions with the ACLU, I believe the key word is in bold: "commercial". For many at the ACLU, the fact that an activity is commercial or for money voids or cancels out any rights one has. Property rights or rights exercised in the conduct of commerce tend to always come last (if at all) at the ACLU. Which is why I donate every year to the IJ, the organization the ACLU should have been if they had not been founded by Stalinists. Update: That is unfair. It's like criticizing someone because of what his father did or believed. Many organizations move beyond their original founder's legacy. But it is never-the-less undeniable that -- at best -- the ACLU has no interest in property rights or commercial freedoms. As the NYT article points out, universities all over the country are facing a world of rapid change. This is going to be hard to face. Universities are structured to adapt slowly—if at all. Typically, university presidents have only limited controls, while faculties have a lot of power to resist. Management is usually decentralized, with different schools and departments governed under different rules and accountable to different constituencies. The fiscal arrangements of most universities are both byzantine and opaque; it can be very hard for administrators to understand or properly and fairly value the true cost and contributions of different parts of the institution. The structural problem our universities face is this: confronted with the need for sweeping, rapid changes, administrators and boards have two options — and they are both bad. One option is to press ahead to make rapid changes. This risks — and in many (perhaps most) cases will cause — enormous upheavals; star professors will flounce off. Alumni will be offended. Waves of horrible publicity will besmirch the university’s name. Option two: you can try to make your reforms consensual — watering down, delaying, carefully respecting existing interests and pecking orders. If you do this, you will have a peaceful, happy campus . . . until the money runs out. This kind of organizational change issue is NOT unique to public institutions. I think if one were a fly on the wall at Sears, or RIM/Blackberry, or AOL, one could describe exactly the same dynamic: insider constituencies were and are successful under the old model, so consensus processes involving these same constituencies seldom lead to change since these changes are inherently threatening to these same constituencies. A simpler way of saying this is that it is really hard to obsolete oneself. Just go ask Blockbuster Video. But there is one difference in the world of public institutions. In the private world, new success models in the worlds of Sears and AOL and Blackberry are already out there and growing really fast, run by outsiders who have absolutely no stake in the success of the old model (in fact by folks who have a strong economic stake in killing the old models). But there is no parallel to capital markets and entrepreneurship in the public space. There is no venue for new-model proponents to get capital and support outside of the old-model institutions. In fact, if anything, public institutions will rally their political clout, up to and including sponsoring new legislation, to make sure new models are strangled in the crib. If I were in the VA legislature and really cared about education innovation in the future, I would give up on UVA driving it and instead take 20% of its funding and hand it off to a brand new parallel entity, say UVA 2.0, run by an entirely new team. I am working on a summary post of the new batch of climategate emails, but this is perhaps my favorite. It is written to Andy Revkin, nominally a reporter for the NY Times but revealed by the new emails to be pretty much the unpaid PR agent of Michael Mann and company. Over and over, emails from Mann and his cohorts get Revkin to write the articles they want, drop quotes from skeptics from articles, and in general coordinate communications policy. I think the notion of telling the public to prepare for both global warming and an ice age at the same [time] creates a real public relations problem for us. Amazing that this actually had to be said. Update: Revkin is currently an opinion blogger but at the time of the emails he was supposed to be a news reporter at the NYT. I have written before that despite being a PC guy, the iPod 2 is probably the greatest piece of gear of I have ever owned. I take it with me everywhere. However, the newsstand is a half-baked mess, and is so bad I can't believe they saw fit to release it in this form. The navigation is totally non-intuitive. I am never clear if I am going to go to the store or my list of downloaded magazines when clicking on a link. The library seems to forget that I own certain issues, and because of the choices Apple made, trying to Kluge the thing into its apps store interface, every magazine is really its own app and the Newstand is actually nothing much more than a folder holding all the apps. This means that the interface changes radically from magazine to magazine. In half the magazines, I still have not been able to figure out how to navigate from inside a single issue back to the overall issue list. And don't look for an integrated issue list across all magazines - there is none. You have to go into every single magazine app to see what issues are available in that particular product. Worse, the subscription system does not seem to work for many of the magazines. I have subscribed to magazines, but that fact is not always obvious in the interface. And in many cases, the magazines I get to download seem to have little relationship to whether I subscribed. For example, I subscribed to PC Gamer but am not offered any of the newest issues to download -- they show up as requiring a full price purchase. There are other bizarre touches as well. The newstand has a little red "2" icon in the corner, which in the apps store means there are two apps that have updates. But I can't figure which of my magazines needs updating -- there is no icon on the individual magazines hinting they need updating somehow, and there is no "update all" button or even a button to see a list of updates available as there is in the app store. Yes, I know the new issues are theoretically supposed to download automatically. The NYT does. A number of magazines don't, and I have had to go into the store and click on them to get them to download. Finally, looking at my iphone, which should have a mirror of all the magazines I have bought on the ipad (same apple account), only about half the magazines show up. This is just a big, big disappointing mess, all the more so because the iPad feels like the perfect device to read magazines. I can only guess this was all driven by a desire to reuse the existing apps micro-payments infrastructure, but the result is very un-Apple. The only reason one tolerates Apple's closed ecosystem and resulting loss of options and flexibility is because it yields predictability, particularly in the interface. Apple has thrown that all away with Newsstand and I can't believe their user community is going to tolerate it. Update: I just googled the Newsstand and I get pages and pages of positive reviews. This absolutely has to be Apple fan-boy crap. Really, the Newsstand interface is really awful. Update#2: The NYTimes apps seems to work beautifully, but most of the magazines have weird interfaces. Again, Apple does not seem to have imposed a single interface structure on magazine app developers, so they all have their own. Huh? Is This Like the Lake Wobegon Effect? This article at Kevin Drum's titled "The Death of Middle Class Neighborhoods" really had me scratching my head. At first I thought this was about an end to self-segregation of the middle class. After all, if middle class neighborhoods are gone, but middle class people are still living somewhere, then they must be living mixed up with other groups. But then Drum says the problem is the increasing self-segregation of the middle class. Huh? How can they be self-segregating more but we end up with fewer all middle class neighborhoods? But then the problem appears to be that the middle class want to hang out with the rich people. Um, OK, I don't find this wildly surprising, though the evidence he cites for this is awful, the typical low standard of science practiced by sociologists everywhere. But Drum himself admits he self-segregates with more educated people, so there you have your proof. We've been fretting for a long time about the rise of gated communities, the abandonment of public schools by prosperous city residents, and the booming market in McMansions. And more and more, this kind of segregation doesn't apply only to the truly rich. Increasingly, even the merely well off hardly have any social interaction outside their own class: they live in different neighborhoods, eat in different restaurants, send their kids to different schools and different sports leagues, and vacation in different places. Really? Like you had a much better chance as a poor person to be hanging out with Andrew Carnegie at the pub than you do today chilling with Bill Gates at a Starbucks? When was this magic past time when the affluent liked to mix more with the unwashed? I hate to just use my personal observations, but Drum does, so here is mine: I feel like many of our meeting places today are less rather than more exclusive. I know a lot of very rich folks, and they simply don't cloister themselves in exclusive clubs and stores like they used to -- I am not at all surprised to see them in the Costco or at the public golf course. I can be persuaded to accept schools as an exception to this, but this hardly does much to help Drum's argument as the government school system has been run (and run into the ground) by his fellow progressives for decades. It says a lot about private vs. public solutions that Costco has found a way to appeal equally to rich and poor but the public schools have not. Update: From the NYT article on the underlying study, note the problem on these maps- the urban boundary in the study is static, so as the city expands, more of the metro area is outside the bounds of the study area. What group likely is the predominent occupant of new suburbs on the leading edge of urban boundaries? Dare I say middle class? The central core of older American cities has always been where the richest and poorest live.You can see this on the Philadelphia maps. The pattern is not changing, just each area is getting larger. A full picture would show the middle class area expanding out as well, but the study cuts off the boundary at arbitrary country lines and never expands the boundary as the city's geographic size grows. The "trend" they are supposedly seeing are middle class continuing to move outwards from the city center, and their flawed study methodology loses visibility to them. This makes more sense than the study's finding, that somehow there is this weird lake Wobegon-type effect where no one is in the middle band of the percentile range. I just returned from the Biltmore, America's largest home. Built by George Vanderbilt between 1889 and 1895, the Biltmore is a symbol of how good the rich had it during the Gilded Age. I'm sure that most of the other visitors would answer "very good indeed." But how many would actually want to trade places with George? Despite his massive library, organ, and so on, I submit that any modern with a laptop and an internet connection has a vastly better book and music collection than he did. For all his riches, he didn't have air conditioning; he had to suffer through the North Carolina summers just like the poorest of us. Vanderbilt did travel the world, but without the airplane, he had to do so at a snail's pace. Perhaps most shockingly, he suffered "sudden death from complications following an appendectomy" at the age of 51. (Here's the original NYT obituary). Whatever your precise story about the cause of rising lifespans, it's safe to say that George's Bane wouldn't be fatal today. I made this observation several years ago, though, though I went west coast railroad entrepreneur rather than east coast. I showed pictures of a San Francisco mansion and a middle class home of a friend of mine in Seattle. One house has hot and cold running water, central air conditioning, electricity and flush toilets. The other does not. One owner has a a computer, a high speed connection to the Internet, a DVD player with a movie collection, and several television sets. The other has none of these things. One owner has a refrigerator, a vacuum cleaner, a toaster oven, an iPod, an alarm clock that plays music in the morning, a coffee maker, and a decent car. The other has none of these. One owner has ice cubes for his lemonade, while the other has to drink his warm in the summer time. One owner can pick up the telephone and do business with anyone in the world, while the other had to travel by train and ship for days (or weeks) to conduct business in real time. I think most of you have guessed by now that the homeowner with all the wonderful products of wealth, from cars to stereo systems, lives on the right (the former home of a friend of mine in the Seattle area). The home on the left was owned by Mark Hopkins, railroad millionaire and one of the most powerful men of his age in California. Hopkins had a mansion with zillions of rooms and servants to cook and clean for him, but he never saw a movie, never listened to music except when it was live, never crossed the country in less than a week. And while he could afford numerous servants around the house, Hopkins (like his business associates) tended to work 6 and 7 day weeks of 70 hours or more, in part due to the total lack of business productivity tools (telephone, computer, air travel, etc.) we take for granted. Hopkins likely never read after dark by any light other than a flame. If Mark Hopkins or any of his family contracted cancer, TB, polio, heart disease, or even appendicitis, they would probably die. All the rage today is to moan about people's access to health care, but Hopkins had less access to health care than the poorest resident of East St. Louis. Hopkins died at 64, an old man in an era where the average life span was in the early forties. He saw at least one of his children die young, as most others of his age did. In fact, Stanford University owes its founding to the early death (at 15) of the son of Leland Stanford, Hopkin's business partner and neighbor. The richest men of his age had more than a ten times greater chance of seeing at least one of their kids die young than the poorest person in the US does today. Hopkin's mansion pictured above was eventually consumed in the fires of 1906, in large part because San Francisco's infrastructure and emergency services were more backwards than those of many third world nations today. Here is a man, Mark Hopkins, who was one of the richest and most envied men of his day. He owned a mansion that would dwarf many hotels I have stayed in. He had servants at his beck and call. And I would not even consider trading lives or houses with him. What we sometimes forget is that we are all infinitely more wealthy than even the richest of the "robber barons" of the 19th century. We have longer lives, more leisure time, and more stuff to do in that time. Not only is the sum of wealth not static, but it is expanding so fast that we can't even measure it. Charts like those here measure the explosion of income, but still fall short in measuring things like leisure, life expectancy, and the explosion of possibilities we are all able to comprehend and grasp. The House speaker, Nancy Pelosi of California, said the sharp rise in premiums for small businesses offered the latest evidence that Congress must act swiftly on health care legislation. "This underlines the urgent need for health insurance reform, including a public option," she said in an interview. "We need to have competition for the insurance companies to keep premiums down." I am only now getting through the 1500 pages of this bill (putting me ahead of Ms. Pelosi in reading it, I am sure), but the last House bill would have been a disaster for my company, increasing taxes on wages by up to 8% and imposing a record-keeping burden that was just horrific. The NYT and the Democrats are apparently trying to set up a mini-class war within bussinesses, snidely saying these companies have more negotiating leverage. Sure. 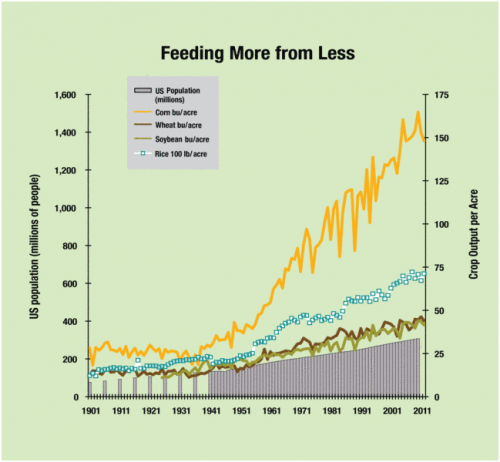 But what they have even more of is the leverage to shape federal legislation to their benefit. However worse a deal my company may get in free insurance markets due to being small is nothing compared to how much worse of a deal we will get from Congress by being small. If they really wanted to cut costs for small businesses, they would strip out all the national and state coverage mandates for things like aromatherapy that raise costs so much and let me shop for insurance across state lines. That would be real competition. Unfortunately, all Pelosi means by competition is throwing Amtrak into the mix to compete with the airlines. Yeah, that will do the trick. world, is language by which we can stand together as Americans. I am confused as to what the substantial difference is between 1 king picking our pockets and 535 kings picking our pockets. Just because I get the annual opportunity to cast a meaningless vote between the Coke and Pepsi party does not change my view of government. To my mind, this is the #1 incorrect perception people have about the American Revolution. So many people, like this author, seem to think it was about voting and democracy. Bleh. The Revolution was about the relationship between human beings and government. Voting was merely one tool among many the founders adopted to try to protect man from government. Unfortunately, this intellectual battle is being lost. JFK was the president that first made it clear that those of us who love freedom have been losing this battle. In his famous quote "ask not what your country can do for you - ask what you can do for your country," JFK defined the heads-statists-win-tails-freedom-loses choice that people like Mr. Conniff continue to try to present us with. These collectivists define our relation to government as either the recipient of unearned loot or milch cow to the whims of the voters. Neither part of JFK's challenge represents a relation between man and government a freedom-loving person should accept. More on why voting is not what makes our country great here. countries to do the same before hunger turns to mass starvation. By the way, these problems with ethanol we are experiencing today were are inevitable as night follows day, yet we still had to blunder into it before we started questioning the economics. The power of political correctness to trump science and logic is amazing. The NYT reports on what looks like a well-reasoned study on officiating bias in the NBA. I say well-reasoned mainly because Steven Levitt, who has become famous for applying tools of economics to such problems, seems to be comfortable with their approach. The key finding is that white refs call fouls on black players at a rate .12-.20 fouls per 48 minutes playing time higher than they do on white players [note that most players don't play a full 48 minutes per game, so the actual rate per player per game is less]. Black refs show the same tendency to call more fouls on whites, though the article omits this rate. That's obviously a bummer -- we'd like to think that stuff never comes into play. However, I would like to offer this bit of perspective: Sixty years ago, black men were not allowed in the NBA. Today, black men in the NBA, along with folks like Tiger Woods, are among the highest salaried people in the world. In 60 years, we have gone from total exclusion to a measurable difference of about 1 foul called every 10 or so games played. That's pretty good progress. My sense is that we make snap decisions about other people based on a wide range of physical attributes, including height, attractiveness, clothing, tattoos, piercings as well as visible racial characteristics (e.g. skin color) and race-related appearance choices (e.g. cornrows). It would be interesting to see where skin color falls against these other visible differentiators as a driver of third party decisions (e.g. whether to call a foul). My sense is that 60 years ago, skin color would be factor #1 and all these others would be orders of magnitude behind. Today? I don't know. While skin color hasn't gone away as an influencer, it may be falling into what we might call the "background level", less than or equal to some of these other effects. It would be interesting, for example, to make the same study on level of visible tattooing and the effect on foul calls. My sense is that this might be of the same order of magnitude today as skin color in affecting such snap decisions. Five years from now, one issue is going to dominate the news on the state and local level. It's not going to be civil marriages or abortion of light rail. It's going to be unfunded pension liabilities. Nearly every city, county, and state government body has promised over-generous pensions to millions of their employees, and almost none of them have been putting any money aside to fund these future liabilities (unlike those evil and untrustworthy private companies, who may not always put enough aside but are at least doing something). Most of us know that the government uses accounting methods and practices that would put private individuals in jail. For example, Enron managers have gone to jail for accounting practices that allegedly attempted to hide liabilities and keep them off financial statements. The government does this all the time, and routinely. Over the next few years, the GASB will require that governmental bodies reveal the size of these unfunded liabilities. And you heard it here first, the numbers are going to be MASSIVE. I am almost sure that the numbers will dwarf the shortfalls in Social Security and maybe Medicare as well. Anyone want to be that politicians will propose to close these gaps by intelligent spending cuts rather than new taxes? HAH! account assets at risk of (in the words of the AFL-CIO) "corruption, waste and Enron-ization." These critics argue that society is much better off keeping Social Security in the honest, benevolent hands of Uncle Sam. though the state now says that the actual amount was zero. Fact: Government Failure. Conclusion: More Government? believe government failure somehow proves we need bigger government. There is much more, from Truck and Barter.